When we were planning our Shed to House Conversion it was a necessity to have running water. We decided that we would use PEX Plumbing over conventional PVC for the ease of its use and affordability. 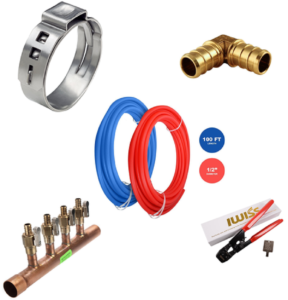 While in the process of shopping for supplies and the items that we would need, I came across a Pex Plumbing Kit that gave me everything I wanted in one place without having to shop around for the various parts. These kits were put together to be used in Tiny Houses, Cabins, or Shed Conversion projects such as ours. 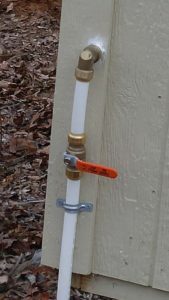 I began by purchasing a roll of 3/4 inch PEX I wanted to use as my main water line from the water meter to our cabin. It worked out perfect as the local water company installed a 3/4 inch meter at the roadway. After we ordered and received the kit I couldn’t wait to start the installation. The day we received it I opened the box in anticipation of seeing what was inside. These kits included one hundred (100) feet each of Red and Blue PEX 1/2 inch rolls of tubing, Twenty (20) 1/2 inch brass elbows, Fifty (50) 1/2 inch metal crimp rings, Tubing cutter, a Crimping Tool for 1/2 inch and 3/4 Inch Metal Crimps, and Two (2) 1 Inch Copper Manifolds with 4 Valves. I still had some reservations if this Kit would be enough to plumb our 12 by 40 foot cabin. You can see in the image below the items included in each kit. After I installed the main water line going to the cabin as you can see below, I began drilling holes in the studs to install the PEX tubing. 3/4 Inch PEX Water line into the cabin with Ball valve for shut off. During the installation I found it much faster and easier to run the tubing to where i needed it to go. 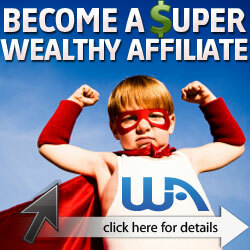 It’s flexible and very easy to put into place. One quick measure with my measuring tape and cut to the desired length with the provided Tubing Cutter, it went by pretty fast! No need for PVC saws, Couplings, Elbows, 45’s, or Glue and Cleaner. For the remainder of the materials that were not included in the Kit, I visited our local Hardware Store and purchased SharkBite Brand Products. I found a couple of places that wouldn’t allow me to make connections with the elbows or crimping tool provided or the connections for the One (1) inch Manifolds to the water supply for hot and cold water. You can see below the Manifolds that I installed using Sharkbite Connectors from the Main Water Line and my Outlet to my Hot Water Heater. 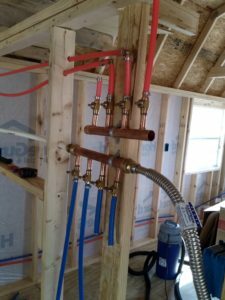 By using the Manifolds with the four valves going to our shower, Bathroom sink, and kitchen sink I would be able to close any individual line going to an appliance without having to shut off the water at the main water source and make any necessary repairs. Another great thing that we have learned about PEX is that if it freezes it will expand to five (5) times the normal size of the tubing before it will rupture. PVC will rupture every time if not properly insulated. I would still recommend insulating PEX where possible for that added protection from freezing. The installation of this particular kit took about two days to install considering I had other projects I was working on at the same time and my employment. Ideally, it would have been a one day project if I had worked in one day. Of Course, having a plan laid out speeds up the installation. I also had enough tubing, crimps, and elbows left over to install plumbing in another project. Now that our Plumbing is installed, I became very impressed with this particular kit. After many searches I found this kit without having to spend my time and numerous searches locating each part that I would need. A Complete Job-In-One Box shipped to my door! Until Next Time – Happy Plumbing! !